We hire mature, qualified, and experienced Trip Leaders. The majority of our staff also work as professional educators, and the average age of our staff is 28. Each of our Trip Leaders must be certified in First Aid and CPR and many are also certified Wilderness First Responders. The most important part of any Global Works program is the safety and well-being of each participant. Global Works is proactive. 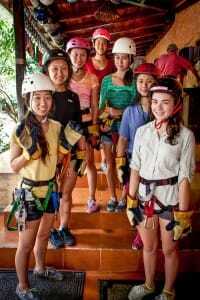 Trip Leaders, chaperones, and participants act as a team. On a daily basis, leaders review safety protocols when they brief the group on the upcoming activities, culture expectations and procedures. Individual and Group Weather Checks are held throughout the program between students and staff. Weather Check Meetings allow students to share medical issues and concerns, social, or emotional issues with their Trip Leaders. Everybody in the Global Works organization is responsible for upholding the Global Works Risk Management policies. Risk Management takes place before, during, and after each and every program. It starts with communication prior to the program when participants speak to Home Office staff and their Trip Leaders. It permeates throughout the program through our contracts, agreements, scouting, and supervision. Finally, after the trip, we reflect, discuss, document, and evolve. Safety begins with choice of location. Global Works chooses the program destination and locations within each country that we travel to based on a number of criteria including, but not limited to: state department warnings (or lack thereof! ), health risks, safe drinking water, and healthy food. All details – from transportation and accommodations to activities and service projects – are planned prior to the participants stepping foot in the country and documented in the Emergency Action Plans. Effective communications begins pre-trip and lasts throughout the program. Global Works has a dedicated emergency phone number, enabling folks to contact a Global Works Director 24/7 during the program.